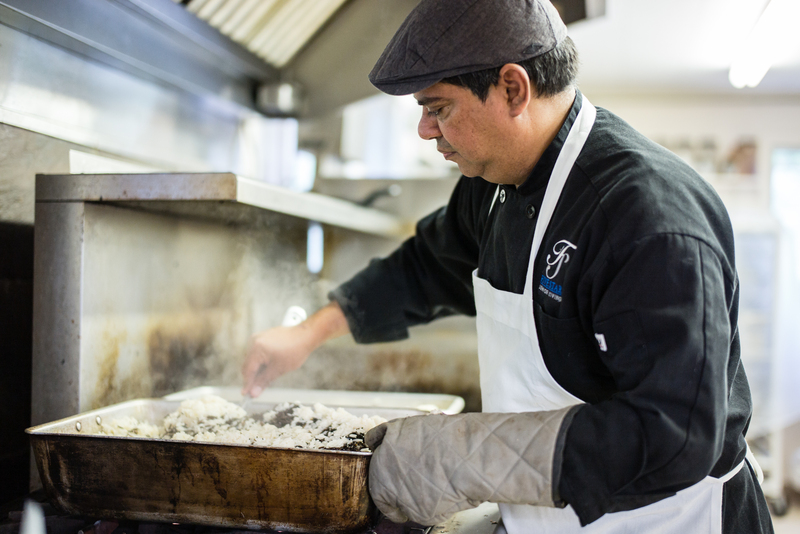 Chef Hugo Fuentes has always wanted to cook. 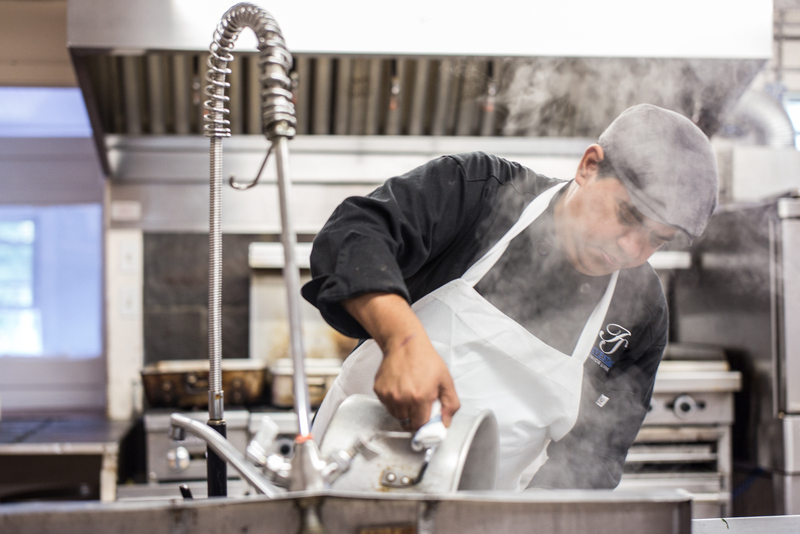 The eldest of five children, Hugo grew up in Puerto Cabello, Venezuela, where his mother encouraged his passion (she has been a chef and caterer for 35 years). After coming to the United States in 2003, Hugo earned a degree in culinary arts and has cooked in all kinds of venues, including country clubs, hospitals, sports arenas, and as a personal chef. When he arrived at Kinhaven in 2015, he concluded that the menus would benefit from an update. “We needed a change,” he says, “meaning fewer cans, less frozen, and more fresh.” Hugo cooks for the Senior Session, the Young Artist Seminar, and the Adult Chamber Music Workshop, spending 11 weeks of the year in Vermont and the rest of his time in his home base of Miami, Florida. It must be a challenge to cook for 140 people and keep them happy and healthy at the same time. So Hugo begins by creating a “smart menu” that covers everybody’s special diets. From there, he obtains as many local foods and seasonal ingredients as possible. He has also introduced international foods, such as arepas, corn pancakes that are a Venezuelan staple, and Japanese meatballs from a recipe that cello faculty Tomoko Fujita’s mother donated. “I took the recipe Tomoko’s mother sent and made 500, and they were all gone,” he says. Always in search of fresh and local, Hugo shops at farmers’ markets, directly at farms, and at nearby bakeries. He notes that he gets good deals and there’s an added benefit to the local economy. Hugo tries to make the kitchen fun “by never saying no.” He says, “I want the kids to feel like they’re at home, since this is their home for the summer. And we think of them like our own kids.” As to the kids’ favorites, Hugo admits the butterscotch brownies are by far the most popular dessert, as they have for the past forty years. “I not trying to compete with those traditions, the brownies, the spaghetti, the breakfast breads,” he says. Nevertheless, he’s introduced new dishes and more variety into the menu. His Cubano, a sandwich recipe he modified to use turkey, is very popular, and the tres leches cake is a hit as well (see recipe below). Editor’s note: Kinhaven recently expanded the dining hall to allow all students and staff to dine together at one time. To complete the renovations, the kitchen needs a walk-in cooler to safely store perishable items. To contribute to the $10,000 cost and installation of the new cooler, please visit the Capital Fund donation page.